This is about one of the lowest mileage Cobras in the world. Not only is it low mileage but it’s got “added value” with some Eye-talian exotica, in the form of a one-off body built in Italy. 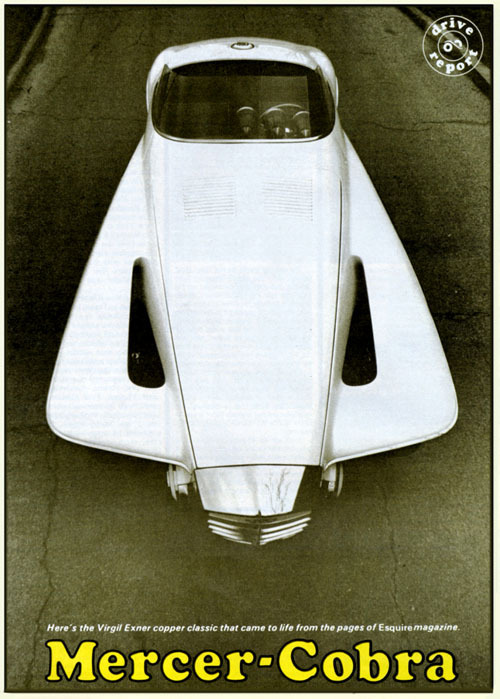 And the designer is famous - the guy from Chrysler who was The Tailfin King. 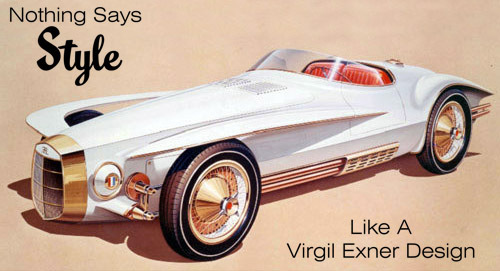 Virgil Exner Sr. was famous for helping start the whole tailfin phase at Chrysler, sold as “the forward look.” Out of some 40 plus “dream cars” bodied in Italy for Chrysler, he was responsible for most of them. 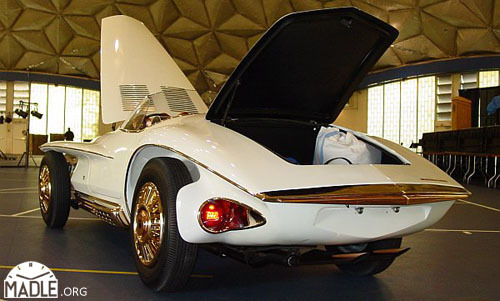 The only one that reached production looking almost the same as the dream car was the Dual Ghia, actually made by a Detroit entrepreneur who bought the design of the Dodge Firearrow show car. The Exners - father and son - were able to save the strong character of the Esquire design in their redesign for the Copper Development client. A 1964 Cobra was bought from Shelby-American and lengthened by 18 inches and the conversion began. A small Italian carrozzeria, Sibona-Basano, run by at least one ex-Ghia employee, was awarded the contract to build the car but the Exners went over to Italy to supervise the building as well. As much copper as possible was featured, even to the gauge bezels which look very much like Chrysler gauges of the last few years. The copper bezels were not functional but underneath the original Cobra gauges were kept. 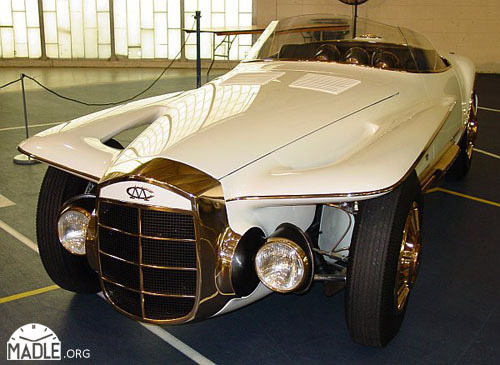 The car was never planned on being drivable so there was a lot of leeway in making the design wild and not having to worry about hobbling the driving. The various metals were finished in the best texture, some of the metals being bronze, some brass, some copper, in order to show the versatility available in each metal. This was a homage of sorts to the art deco movement in design which in part involved highlighting the natural finish available in metal (see the elevator doors in the Chrysler building in NYC, for instance). 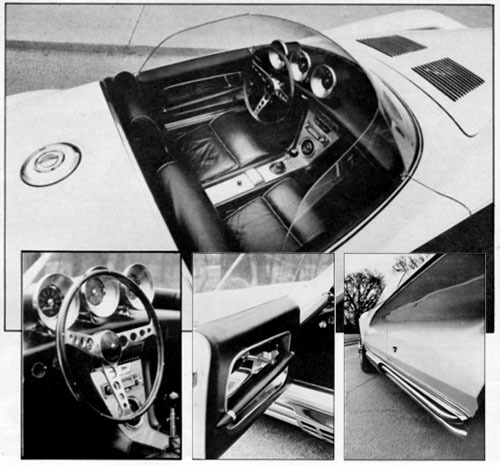 In June 1979, the car was offered for $165,000. That was before Gen.William Lyon, a California home builder, bought it and it was under his ownership that it was displayed on the “dream car lawn” at Pebble Beach. 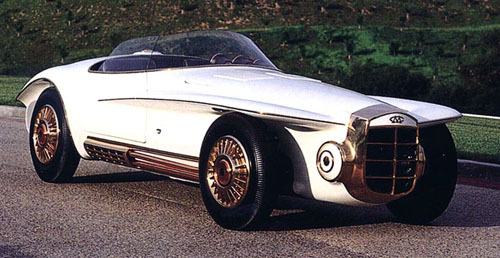 Though it would easily be worth $300,000 to $500,000 if rebodied as a small block Cobra, it would be far more interesting if this ever comes on the market again as the Mercer-Cobra! 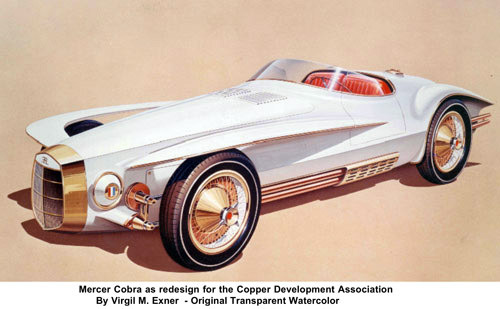 Ironically, though Exner was responsible for the tailfins at Chrysler, the Mercer Cobra does not feature them. It’s the ultimate in long hood,short rear deck styling and still looks modern today. See more images of the Exner Mercer Cobra at Madle.org. Wallace Alfred Wyss is an author and a design critic who also does some fine art. To see his art on classic cars, visit VeloceToday.com. Click here to read about one of his Cobra books.